Because most of your regular income goes to paying for living expenses, there’s often no room in your budget to pay off debt. At least that’s the way appears on the surface. 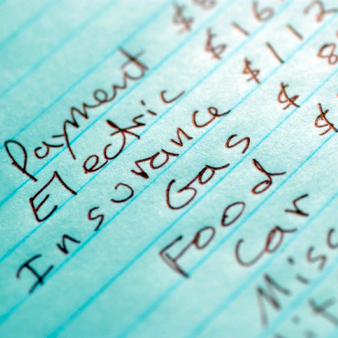 Most of us can cut or eliminate various expenses that will provide the ability to pay off debt. When you actually take a close look at how and where you spend your money, it can often become obvious that there’s room to cut. 1. Put an immediate stop to all discretionary spending. There isn’t much you can do about your basic fixed expenses, such as your house payment, car payments, insurance premiums or even many utility bills. That forces you to focus on the spending areas that often give us the most pleasure. While we may not like cutting those either, they can be a major source of extra budget space to pay off debt. Eating out is often a rich source of savings. It has become so normal to eat out – workday lunches, gatherings with friends, or even when you don’t feel like cooking – that we may not realize that we have an option not to do it. There are also certain recreational habits that we have, such as going to the movies and other pastimes. This isn’t a pastime you have to give up for the rest of your life, but you do have to reduce or eliminate them until you get the upper hand on your debt. 2. If you don’t absolutely need it, get rid of it. One of the big problems with cable TV is that you pay for 200 channels even if you only watch 15 or 20 of them. Can you reduce the number of channels? Can you use alternative services? Could you do without TV for a few months to help you pay debt? Cell phones are great, but they come with a lot of costly bells and whistles. For example, do you really need Internet access on your phone? Do you really need unlimited texting? Unless you need these services for business, they may be luxuries more than necessities. Do you maintain a gym membership for a gym that you no longer attend? Do you subscribe to magazines that you don’t read? Do you have memberships in organizations that you don’t even participate in? If you need pay off debt, get rid of them all. Look around your house – do you have items that you no longer need and can sell for money? This is an easy way to find extra money to pay off debt. If you haven’t used the item in at least a year, it should be a candidate for sale. This includes cars that are not entirely necessary, boats and even vacation homes. If this sounds like a lot of sacrifice, just keep in mind that a lot of extraneous spending is done in an effort to deal with stress. But if you concentrate your resources on paying off your debt, you will be removing a major source of stress. Once that stress is gone, you may not need all of the extras that you are now spending money on. 3. Stay away from your TV. If you want to make room in your budget to knock out debt, you must eliminate or seriously reduce the amount of time you spend watching TV. In part, this will free up your time to find ways to make extra money (next section). But just as important, TV is primarily a marketing tool, that is designed to get us to buy products and services. The more time you spend watching TV, the more you’ll be driven to consume. You can save money simply by turning off your TV and doing something else. Speaking of which . . . .
4. Use your spare time to make extra money. If you need to get out of debt, you may also need to increase your income. Blending spending cuts with increased income is the most effective way to supercharge your debt payoff. Consider getting a part-time job or working overtime on your main job. If you have special skills, start your own side business or even offer yourself out on a contract basis. You can probably make a lot more money with either of these approaches, rather than with a part-time job. And it can often turn into a lucrative side business that will enable you to pay off your debts even faster, and then to begin building up savings. If you need to pay off debt, you should think less about leisure time and more about productive time. 5. Stop funding your retirement plan. Financial advisors often recoil at this recommendation, but if you are deep in debt it’s a perfectly reasonable strategy. End your 401(k) contributions until your debts are paid, but be sure that you redirect the extra take-home pay into paying off your debts. Once they are paid, you can resume your contributions. This is far better than withdrawing money from your account (incurring tax liabilities) or taking a loan against it (replacing debt with debt). 6. No vacations until your debts are under control. To many people, an annual vacation has become an expected part of life. But if you have substantial debt, you should let go of that notion until your debts are paid. Even a fairly simple week long beach vacation can cost several thousand dollars. That kind of money would be better spent paying down your debt and relieving long-term financial stress. 7. Cut your grocery bill to the bone. Meat is expensive – cut down to eating it 3-4 times per week instead of seven. Do at least some shopping at food warehouses (Costco and Sams), try Aldi (milk $2.49 a gallon), and even a dollar store (where the same bread at a grocery store at $3.29 goes for just $1). Use coupons to the greatest extent possible. Buy bulk items on sale. Store brands are cheaper than name brands and many are just as good. Make fewer, larger shopping trips so you can avoid running out for a few items every few days (you spend more doing that). Remember, you don’t have to do any of these forever – but just until you get your debts under control. Think of it as going on a diet until you lose as much weight as you need to. Do you need to pay off debt? How are you going to make room in your budget? Leave a comment! Hi Rebecca – If you used budget cutting to afford to pay cash for a vacation, you can use it for any purpose you need to. Great list! Although, I confess that even with a slashed budget we made room for a modest family vacation this year, paid in cash and done on the cheap.